Ready for vacation? Extraordinary design hotel on an island in the middle of the Danube river. With a postcard like view to the Steinerne Brücke (Stone Bridge) across the Danube river, the Old Town and the Cathedral. The heritage-protected hotel building once used to be a manufacture of arts and crafts. Enchanting location, quiet and central. The hostel for the Young and the Old in the centre of the medieval town of Regensburg. 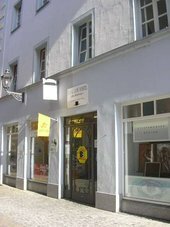 As the only hostel in the centre of the Old Town we offer an inexpensive and favourable possibility for everyone to stay overnight in single or twin rooms. Feel at home in one of the most beautiful cities in Europe – now also with World Cultural Heritage. You are right in the middle of it! “Die greatest sensuality is imagination…” – Christian Morgenstern (1871-1914). 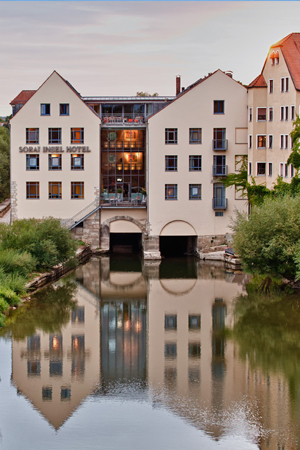 In the centre of Regensburg’s Old Town – right at the Cathedral – you can find a different kind of hotel. 4 floors… 4 elements… 4 x extravagance. Exclusive interior and young design create a special atmosphere in the historical rooms. Fire, water, earth, air – cold steel, shiny amber, sparkling water and heavenly beds… Visit us now in the heart of the Old Town. The Castle Boutique Hotel offers seven individual themed rooms and was lovingly redesigned at the beginning of 2018. It is located in a heritage-protected building from the 17th century and has a special charm due to the old building. Due to the good location in the city centre you can reach the most important sights and the pedestrian zone within a few minutes on foot. 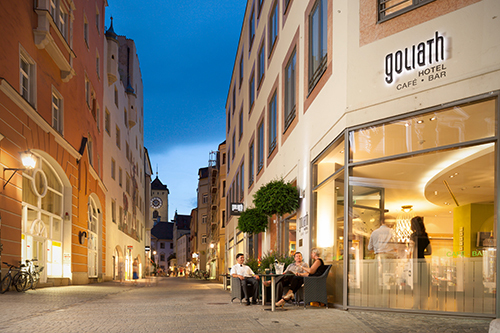 Unique is our southern location with an unobstructed view of Thurn & Taxis Castle and the beautiful castle park, as well as our familiar atmosphere. HOur Hotel Weidenhof is a 3-star city hotel located in the heart of the historic Old Town of Regensburg. All important sights of the world cultural heritage Regensburg are practically in front of our doorstep. Our guests can enjoy the comfort of a modern city hotel as well as the flair of an old town house. The bathrooms were modernized in 2017. Our parking spaces in the multi-storey car park at the Dachauplatz are around the corner. You are welcome to unload your luggage directly in front of the hotel. The main train station is only 400m away. 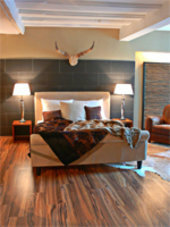 We are the ideal starting point for your visit in Regensburg. Kathy & Leo with team. You will feel very comfortable in any one of our total of 41 rooms. With style and class in every detail, we have given the rooms a unique character as regards color, fabrics and furnishings. Unique, just as each person is unique. Tells us your favorite color and experience the style and comfort of our hotel. All rooms and suites have insulated windows, direct dial telephone, W-Lan, flatscreen cable TV with access to Sky pay-TV programming, air conditioning, minibar and safe. Our bathrooms are appointed in natural stone with a bathtub or shower, bathrobes, make-up mirror and hair dryer, as well as a separate toilet room. One of our rooms is handicap-accessible for people in wheel chairs. Over the restaurant in Unteren Bachgasse Nr. 8 you will find our “Großes Haus”, a spacious baroque house with antique floorboards, baroque door frames and beautiful stucco ceilings, sometimes with room sizes of 60 sqm. All rooms are differently and originally furnished. Here you will find antique furniture, chandeliers, old wardrobe cases and four-poster beds. 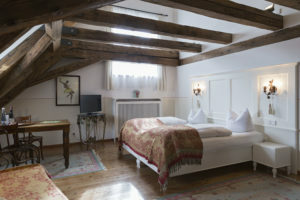 The attic rooms offer various views over the towers of Regensburg. Lift is available up to the 4th floor.